The former chief financial officer of the Chicana Service Action Center, who pleaded guilty to embezzling and misappropriating millions of dollars in public funds, was sentenced Friday to a year of home arrest and ordered to pay more than $10 million in restitution to three public agencies. Los Angeles Superior Court Judge Michael Pastor also ordered Silvia Gutierrez, 71, to serve five years on probation and suspended a four-year state prison term that she could face if she violates the terms of her probation. Gutierrez — who used public money for bonuses, life insurance and other expenses — pleaded guilty in August to six counts of embezzlement, four counts of misappropriation of public funds and two counts of preparing false documentary evidence. Three other people, including two other former executives of the group, were sentenced last week. Sophia Esparza, the former CEO of Chicana Service Action Center, was sentenced to six years in state prison and ordered to pay more than $10 million in restitution to two Los Angeles County agencies and one Los Angeles city department. Reports Wednesday that administrators at a venerable charitable organization have strayed far from the organization’s mission to help the disenfranchised in Latino neighborhoods are hard to take. Top executives of the Chicana Service Action Center are being accused by Los Angeles County prosecutors of embezzling taxpayer funds through a billing scam that allegedly allowed them to skim off more than $8.5 million to enrich themselves with fancy homes, cars, expensive trips, and other luxuries. This is particularly devastating news to the women still alive who decades ago struggled mightily to get the organization off the ground so it could help empower Latinas by giving them job training and other resources as a way out of poverty and sometimes an escape from domestic abuse. Francisca Flores, Chicana Action Service Action Center’s first Executive Director (not the president or CEO), was a dedicated leader who did without and lived in a small apartment on Mott Street in East Los Angeles so that other women would have a chance at a better life. The same can be said for the assistant director, who lived in an apartment in the San Fernando Valley, as well as and many of the organization’s Latina board of directors who were deeply dedicated to the mission of helping women to help themselves and heir families. Over the years, some of our nonprofit community based organizations have expanded and gained greater expertise, becoming large organizations with multi-million dollar budgets. Many of them are doing important and good work, helping people who have few resources to help themselves. Sadly, however, today we see a growing trend in nonprofit community groups of blurring the lines between the needs of the community and the personal needs and egos of the organization’s staff and high powered boards of directors. The lines between investor owned corporations and public benefit community-based corporations and organizations have been clouded by the quest for personal power and financial gain and public image. 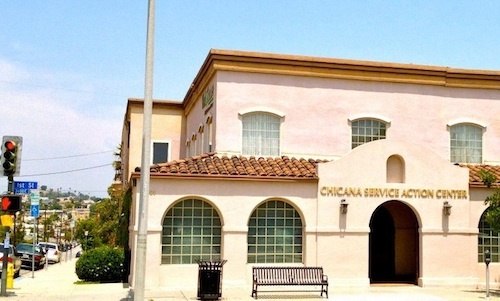 We’ve observed too many of our new generation of community leaders turn from being selfless to being selfish, which may be the case at the Chicana Service Action Center. We have all heard of nonprofit executives and others who serve the public say they are entitled to big salaries and perks comparable to those in the private sector: We say, then go work in private industry. We deeply hope, whether the allegations are proved true or not, that other charitable organizations and community groups will see this as a warning not to lose their sense of mission and dedication to community, or to become blinded by the profligate ways that access to large amounts of money can inspire. Don’t get us wrong, we fully understand that this is not a phenomena unique to Latinos, but at this Hispanic, family-owned publication, it just hurts more. Update: Corrected Francisco Flores to Francisca Flores.